The model SL3488 in line ultrasonic flow meter (here in after referred to as SL3488) is a true state-of-the-art transit-time flow meter designed using PICOFLY technology and 0.01 nanosecond (10 pico seconds) resolution; the flow sample rate achieved is 256 discrete flow measurements per second, which provides a true high dynamic response flow meter. This makes this meter for rapid on/off or pulsating flow applications. SL3488 is designed using the latest digital technology. This meter features high reliability, low maintenance and no moving parts. Unique digital signal processing and correlation programming from the MPU provide instantaneous meter measurement (no damping needed) SL3488 ultrasonic flow meters has been tested under rigorous field working conditions and has shown steadfast performance, which offers the customer confident worry-free measurement. Choose a sect ion of pipe, which is always full of liquid, such as a vertical pipe with flow in the upward direction or a full horizontal pipe. Ensure that the pipe surf ace temperature at the measuring point is within the transducer temperature limits. Note : Ensure the pipe on both sides of the flow meter is straight. Note : The ultrasonic flow meter should be installed in a pipeline that is full of fluid. 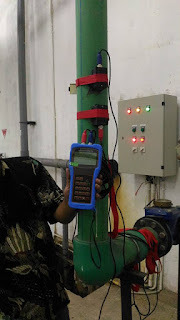 If the pipe is not full or there is only one free horizontal pipe (discharge), connect the transducer in the lower part of the pipe.